Unifying many generations of CSU alumni with a celebration that they can all be proud of. 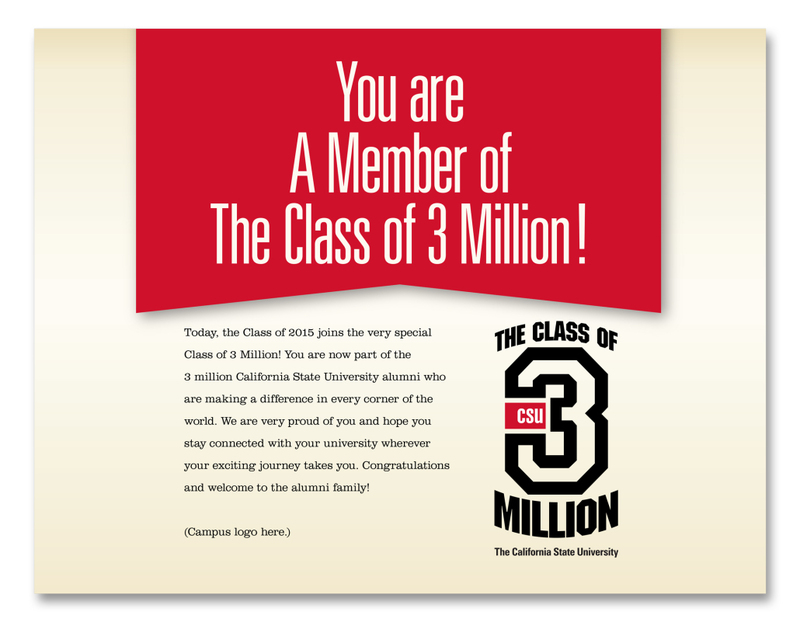 The California State University system had a significant milestone happening in the Spring of 2015. 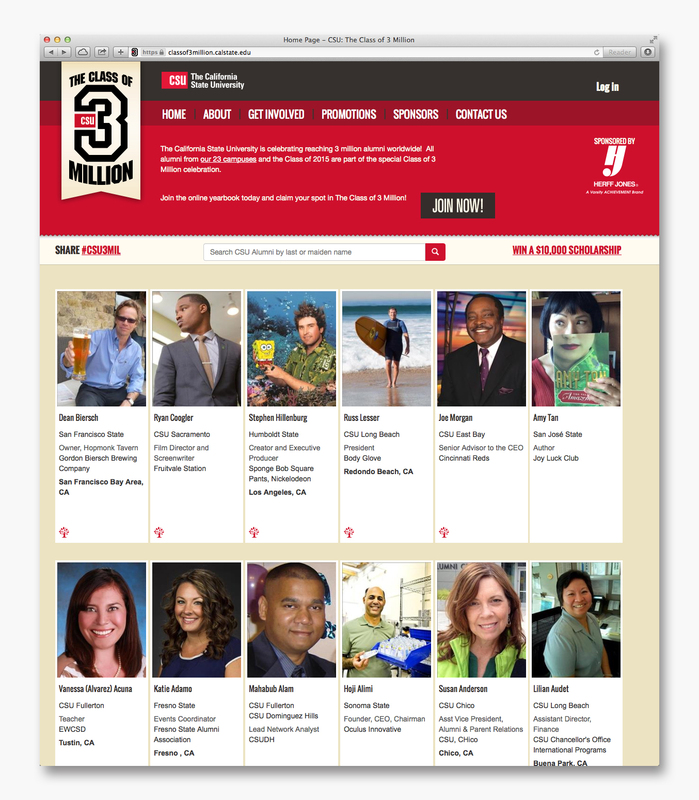 They were going to graduate their 3 millionth alumni. 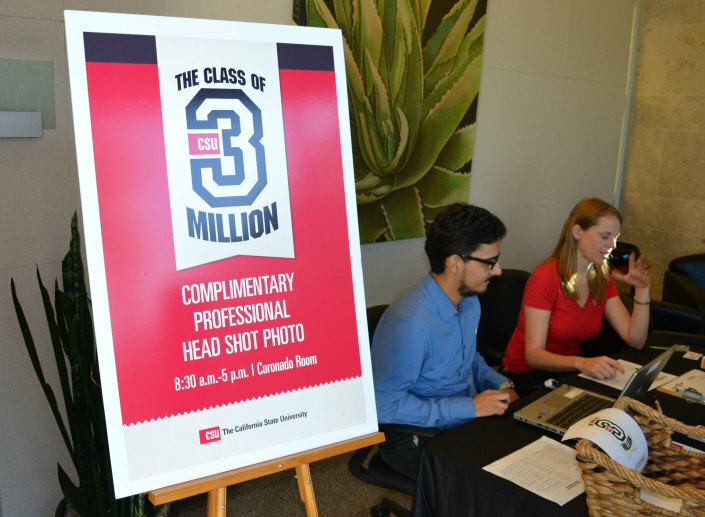 This was a huge achievement that no other university system could lay claim to. They rightfully wanted to celebrate and bring attention to this remarkable event. The CSU is an impressive institution that has been instrumental in laying the foundation for the strength of the California economy. However there had been confusion among many regarding which campuses were part of the system. 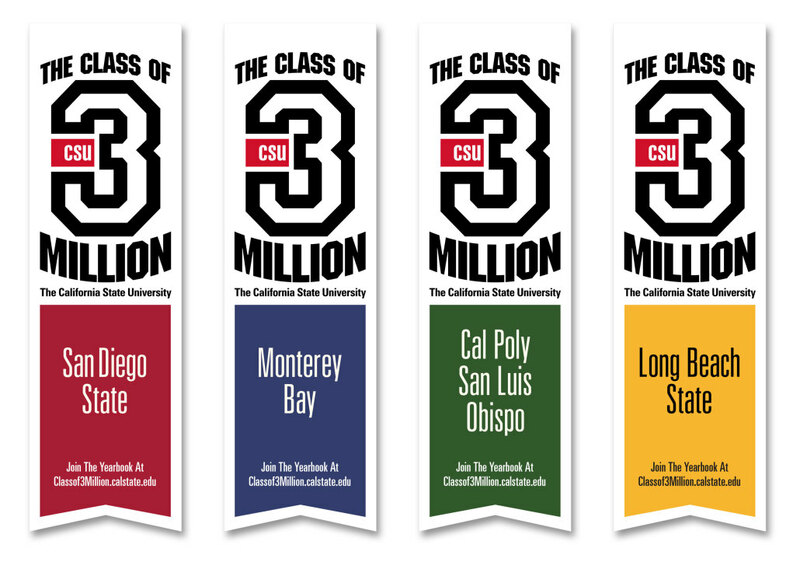 Some of the CSU campuses proudly displayed their association while others were not as active. 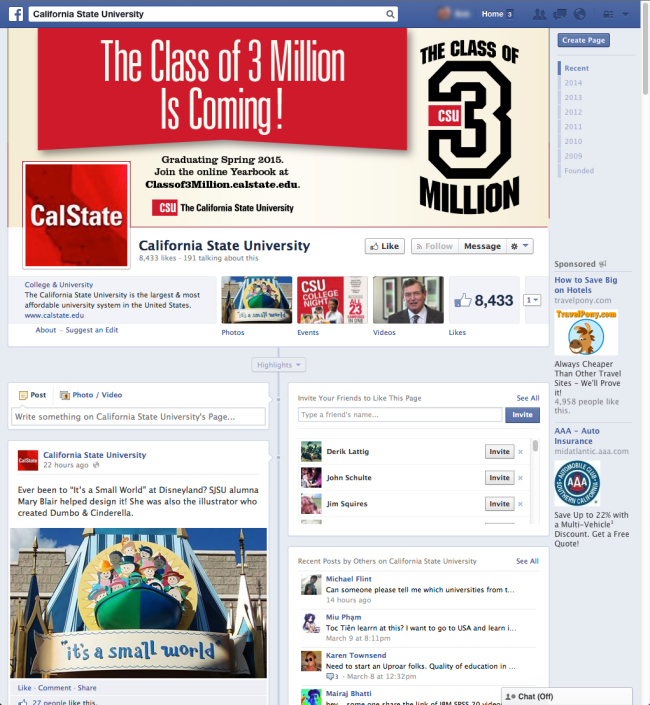 This inconsistency has led to much confusion as to the scope of the CSU system as a whole. The graduation of the 3 millionth alumni is an achievement that no other university system can match. This was the time to set the record straight and recognize the CSU for what it is, an effective and impressive system of higher education that has fueled one of the largest economies on earth. 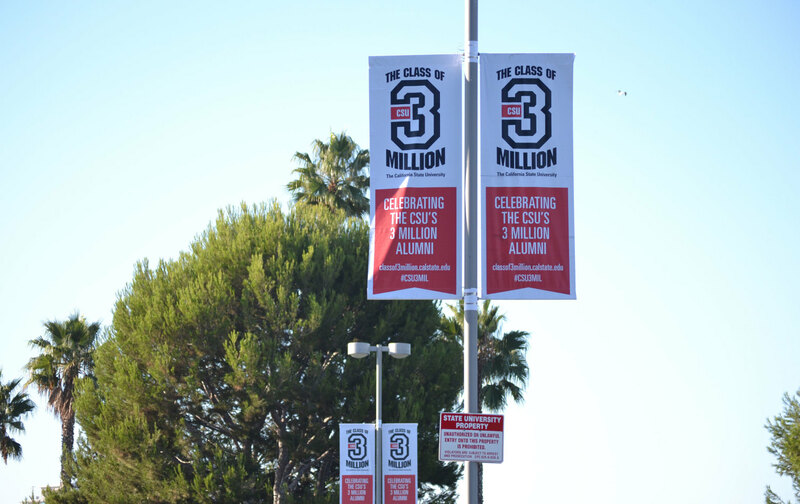 The big question was: How do we get every living graduate – all 3 million of them – from 23 different, and sometimes competing universities, to feel connected to this celebration? This was a big task. Looking back at the tradition of education, we found something that embodied the spirit of unity that all classmates from all backgrounds can feel for their shared educational experience. The best way to bring all of these alumni together is to connect them all like you would a graduating class! That’s when The Class of 3 Million was born. 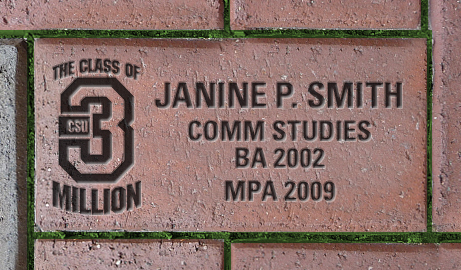 And now that we had a name for our unique class of alumni, they needed a unifying place to come together. Like the yearbooks of old, we came up with the concept of an online yearbook where all alumni can easily register, connect, explore and feel proud of being a part of something really big. 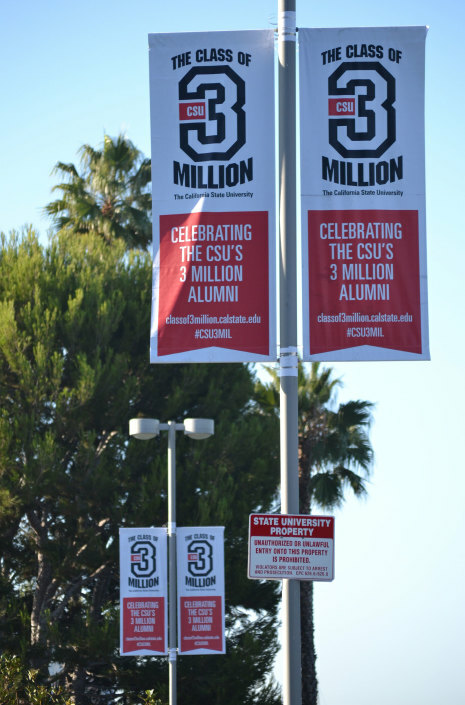 The CSU Alumni giving increased 44% systemwide and reconnected with 60,000 alumni as a result of the promotion. The CSU Class of 3 Million promotion is a winner of 5 Golds at the CASE – Council for Advancement and Support of Education – Awards of Excellence Program! with a shout out to MIX. We developed an iconic logo system that would form the backbone of the graphical approach to the promotion. Following in the theme of the Yearbook, we borrowed from the past but with a modern twist. The typography and pennant banner frames are all rooted in the familiar stylings of school tradition. These remind us of shared school pride, but in a bold new interpretation. The 3 becomes a dominant part of the image. The bottom line is this is really a huge number. Everything about this celebration is this number so the focal point should be just that. 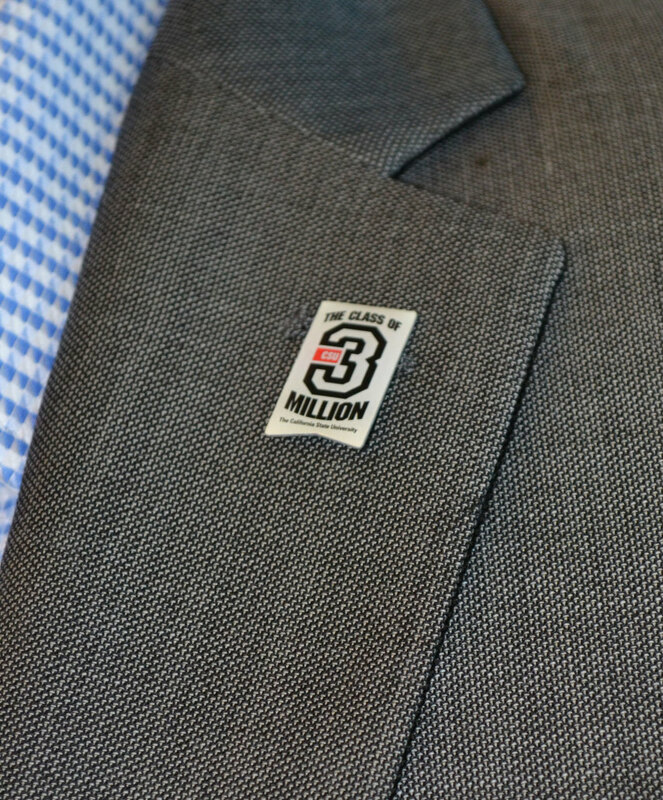 3 Million! 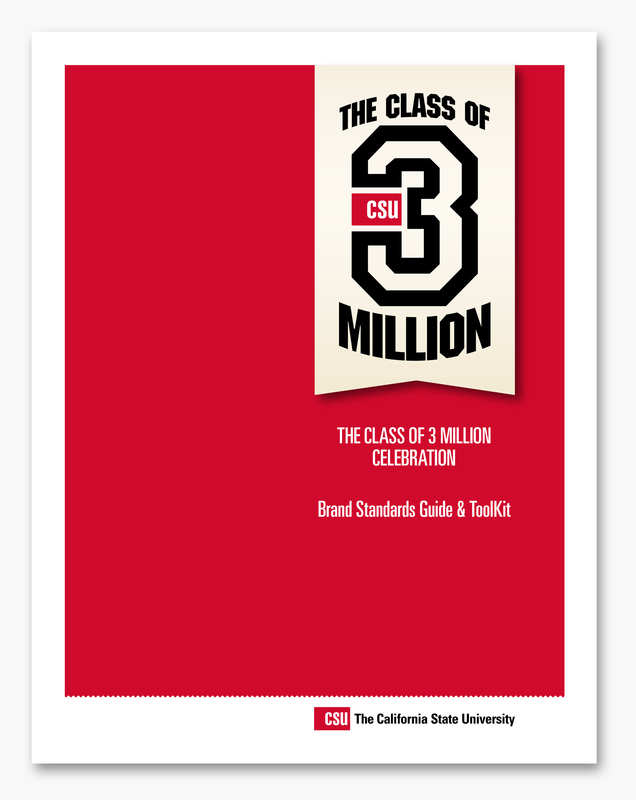 The integration of the CSU logo mark illustrates the integration of the system. 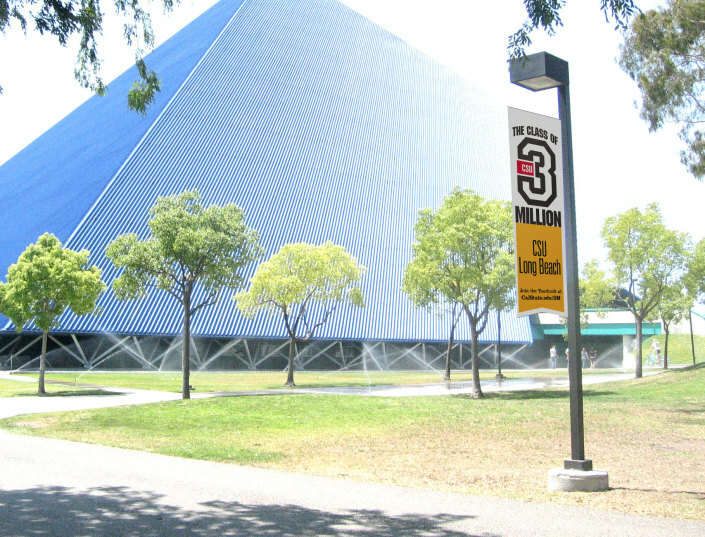 In a way, the extenders from the 3 seem to grow out of the sides of the CSU square. This beautifully illustrates that out of this system has grown a very big achievement. 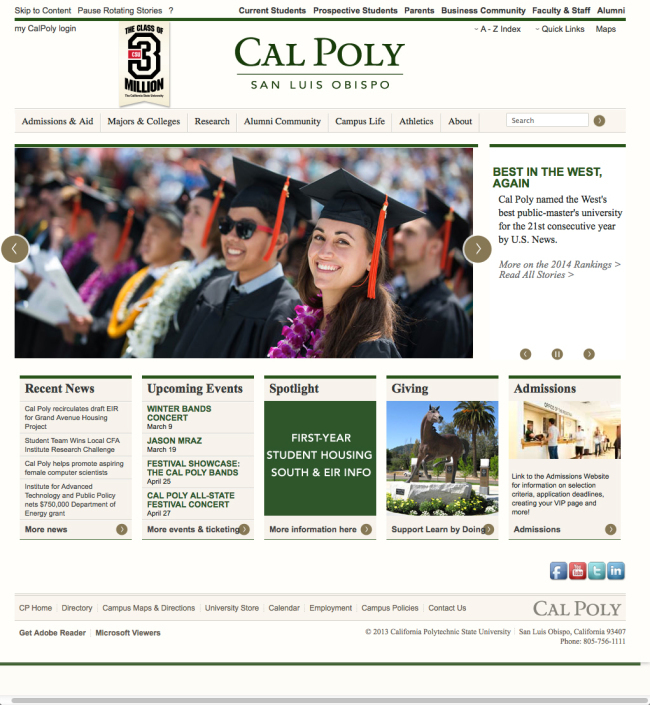 The focal point of the campaign is the online Yearbook. 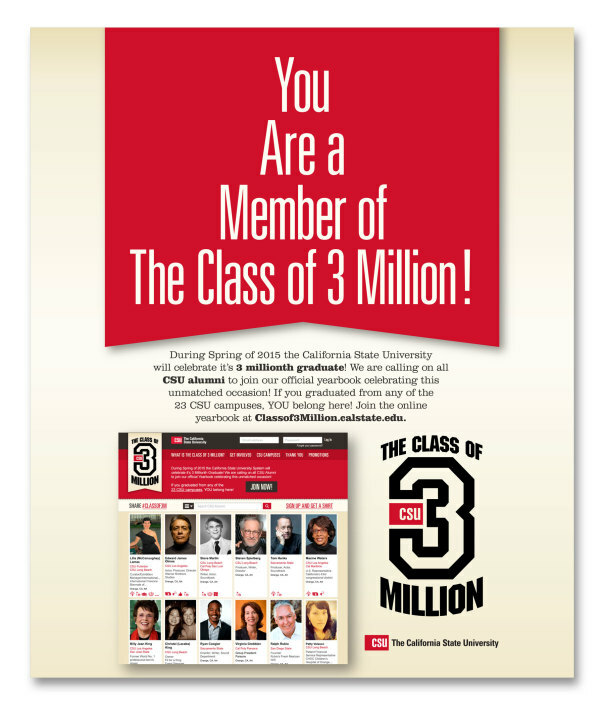 This is the place where all past and future alumni can go, register and belong to The Class of 3 Million. This is where you are counted! You will also be able to find old friends, discover new ones, or just be impressed by the impressive list of famous names that are a member of this university system. The job we were given was to increase the data that the CSU had on it’s existing alumni. 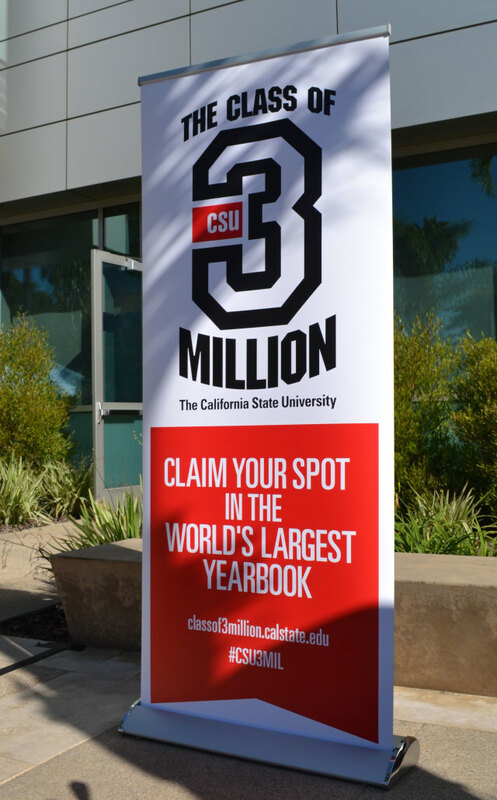 The concept of the yearbook helps to create the enthusiasm and unity to bind together all CSU alumni like never before. 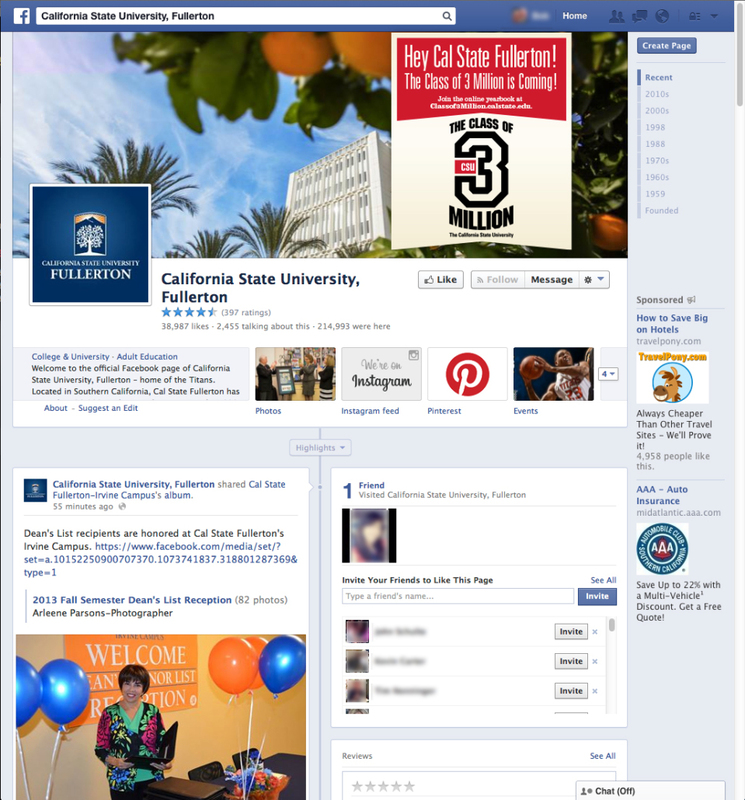 It also allows us to gather the contact information so that the CSU can better communicate with it’s alumni. 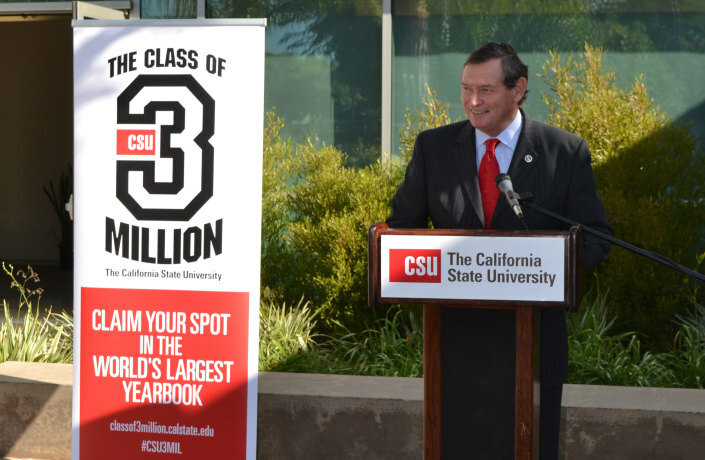 This ultimately will help the CSU grow and prosper into the future. CSU needed a tool kit that would explain the program to the various schools and their staff so that they could understand it, get excited about it, and ultimately roll it out for their campus. It needed to go in depth and explain the opportunity and the thinking behind this promotional brand. It also need to be filled with easy-to-use templates for the elements that they would need to get the word out to their alumni. What we delivered was The Class of 3 Million ToolKit. This book provided all of the back story for the brand and the marketing elements. It also contained guidance for PR initiatives and social media tools such as sample tweets and Facebook post ideas and graphics. CSU has been thrilled with the effectiveness of this ToolKit. It helped them gain legitimacy for their internal audience to rapidly build momentum and get people on board. They’ve sited this book as being integral to the promotion gaining speed so quickly. 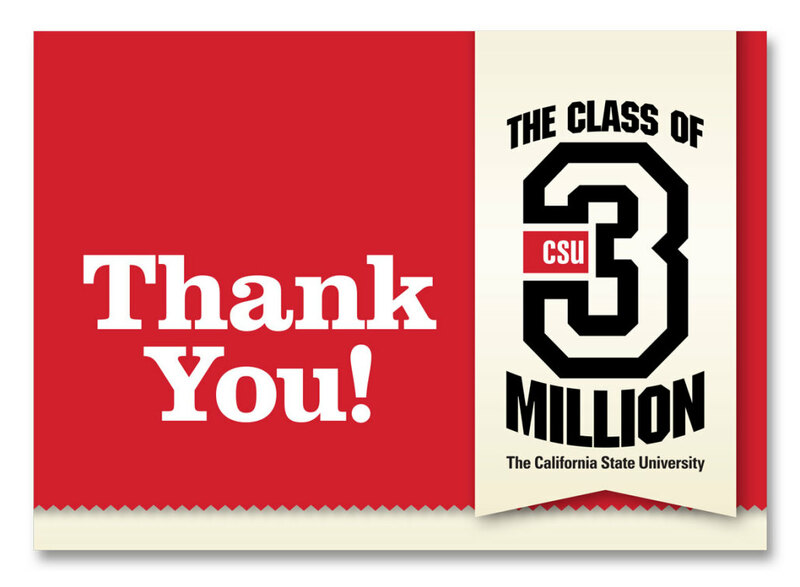 As a result, the entire system is enthusiastically rallying around The Class of 3 Million!